On June 4 2007 a 30 year dream came true that changed the dynamics of recreational cycling at the Delaware Beaches. 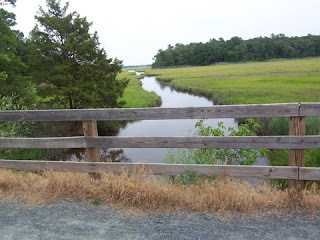 The Junction and Breakwater Trail linked the quaint City of Lewes (pr. lewis) with busy Rehoboth Beach with a fine gravel trail. Cape May of course is known globally for its architecture and famous BnB's. The loop ride goes out out to Cape May Point. It's a small town with a lighthouse and quiet beaches. Cape May Point is the end of the road and has very little automobile traffic but lots of bicycles. It feels like you are closer to Nantucket than Atlantic City here. Adjacent to the Delaware Ferry Terminal is Cape Henlopen State Park. Accessible from the terminal via bike lanes is a paved path that winds past sand dunes, WWII lookout towers and Fort Miles. In the southern section of the park lies Gordon's Pond, which is inaccessible from the main section of the Park because a large segment of the park is set aside as a nesting area for Piping Plovers and Terns. The Junction and Breakwater Trail which is a part of Cape Henlopen SP serves as the missing link between the north and south sections of the park. NJ TRANSIT route 316 runs every 90 minutes or so during the summer from the Greyhound Terminal at to Cape May. Travel time is about 3 hours. If you're adventurous you can return from Delaware on DART to Wilmington then connect with SEPTA back to Philadelphia, note that there is no Sunday SEPTA service from Wilmington and weekday connections involve 2 transfers via Georgetown and Dover. During the off season the only reliable way to Cape May is via NJ TRANSIT's Route 552 bus which connects to Philly bound trains and buses in Atlantic City. Awesome! Why don’t you share your thoughts about your weekend on http://www.funpiper.com. Its worth sharing with people looking out for some weekend fun posts and planning.